We have been extra busy this off-season putting all the final pieces in place for the upcoming season. It is promising to be one of the best schedules in Firebird history. The 2017 track schedules have mailed. 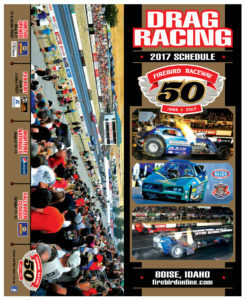 Or you can pick up a schedule at any track sponsor location. Starting in early-April and continuing through October, the schedule is loaded with wide array of events. Headlined by the grand daddy of them all, the Pepsi Nightfire Nationals will be help us celebrate a special 50th anniversary. Firebird’s signature racing weekend will take place on August 10-13. The planning wheels are in motion for what promises to be an extra special weekend of racing. The event is aligned with the NHRA Hot Rod Heritage Racing Series. The Nightfire will feature AA/Funny Cars, AA/Fuel Dragsters, AA/Fuel Altereds, Pro Modified Doorslammers, and the famed Bracketeer Series. Many recognizable and highly popular events and series return to the Firebird racing docket. The Fairly Reliable Bob’s Club Challenge Series, High School & Alumni Championships and more star in the Spring and wrapp up in September. We will launch the new season with the Division 6 Lucas Oil Drag Race Series. The 47th annual NAPA Auto Parts Ignitor presented by Peterson Chevrolet takes place May 5-7. The race will feature an open-qualified field of AA/Funny Cars. Other classes include: Top Sportsman, Top Dragster, Comp, Super Stock, Stock, Super Comp, Super Gas, Super Street, Sportsman Motorcycle/Sled, Super Pro, Pro, and Heavy. The Little Caesars Pizza Fox Hunt returns over the June 16-17 weekend. Presented by Bronco Motors, the Fox Hunt showcases Jets, Funny Cars and the Outlaw wheelstander. Unique to the Fox Hunt weekend, all ladies get in for free. The 24th Annual NAPA Auto Parts Halloween Classic returns on October 11th-15th. Click the hyperlink (below) and you can view the entire, simplified version of the 2017 Season.